Thanksgiving has always been my favorite holiday because of the three Fs: family, food, and football. These past couple of years I've been able to add one more "F" to the list - family history. A few years ago I tried explaining to my children how their mother (my wife) and I are related because we both descend through Stephen Hopkins who sailed on the Mayflower. I'm not sure they quite understand how that makes my wife and I 13th cousins. However, one Thanksgiving a couple of years ago, we were reading a children's book, The Thanksgiving Story by Alice Dalgliesh, which recounted the story of Stephen Hopkins' family's trip to America aboard the Mayflower. I was stunned when my then-4-year-old said "Daddy, Stephen Hopkins is our ancestor!" Every Thanksgiving we now read The Thanksgiving Story. We'd like to wish all of our Legacy Family Tree users a happy Thanksgiving. We're going to take a couple of days off and hope to enjoy family, food, football, and family history. If you live in the Austin, Texas area and are interested in participating in a new Legacy user group, please write to Roberta Jenkins. Roberta is one of our fantastic Legacy users who joined us on the 2008 Legacy Genealogy Cruise to Europe, and is trying to organize a group. Legacy User Groups are held around the world. Some groups meet monthly, others meet quarterly. 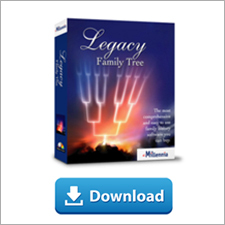 To see if there is a group in your area, visit our user group page at http://www.legacyfamilytree.com/UsersGroups.asp. Although we do not sponsor or direct user group meetings, we will try to help interested persons make contact with each other who may want to form a group. Send us an email if you want more information. We also make presentations to genealogy societies. This weekend we spoke to a great group in Fresno, California. If your society is looking for a special 1/2 or full-day seminar on genealogy technology and/or Legacy, send us an email. This past week at Millennia we have actually experienced what it is like without email. I do not know the details, but since last Thursday we have not been able to receive your messages. If you have emailed any of us at Customer Support, Support, or any of us personally at Millennia, we have not responded to you because we have not received any emails. Obviously it is not good for a company like ours to be without the normal methods of communication with our customers, and we apologize for this inconvenience. Our guys have been working around the clock to get this resolved, so hopefully we'll be back online soon. Feel free to give us a call (800-753-3453 for sales or 425-788-0932 for technical support). After the initial shock of being email-less, and staring at my dual monitors wondering what I should do next, I've actually got quite a bit of work done. Now what would I do if my personal email account went down? Write a letter...on paper...with a pencil...find a stamp...and mail it? This article is the second in a series of articles which will help you prepare your family file for better use with the upcoming Legacy 7.5 and its interface with FamilySearch. Even if you do not plan on synchronizing your data with FamilySearch, these articles will provide valuable insights on cleaning up and standardizing your data. Click here for the first article. In our first article we stated "before interfacing with FamilySearch's new Family Tree system, we should all take a closer look at our data." If your data has problems similar to the cartoon's, and you publish this data online, the data online now has these same problems. So before you publish your data anywhere, use Legacy's Potential Problems tool. 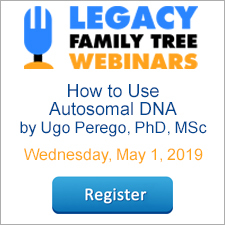 Using this tool, Legacy runs through your family file and checks the information for some common and sometimes unnoticed discrepancies. Normal check of all records. Notice that each option is selectable, in other words, if you only want to check your family file for persons who were buried 30 days after their death, select that option, and turn off all the other checkmarks. You can also adjust the values. For example, by default Legacy will warn you if a child was born when the parents were less than 13 years old. You can change this to 10 years old or whatever value makes sense for you. Now click on the Create Problems List button (no this will not "create" problems, it will create the list of problems). The image below shows a list of potential problems. The first problem is that Kenneth Brown's birth date is more than 20 years after the marriage date of the parents. Although not the norm, this may very well be true for this child. If so, just click on the Mark as Not a Problem button, and this potential problem will not show up again. But it may be worth looking at, so using the Edit buttons on the right you can investigate further. This certainly looks like a potential problem, and before sharing this data with FamilySearch or anywhere else, you should reinvestigate this family. My personal database has information on lots of people that are not closely related to me (8th cousins, 4 times removed, etc.). To begin, I want to focus my clean-up efforts on my direct line. From the Records tab, I can limit the records being checked to those with a certain "Tag" number. For example, I can mark everyone on my direct line with a tag value of 1. Then I can have the Potential Problems tool only report problems of people on my direct line. For step-by-step instructions on how to use tagging, watch this video. You're now closer to being ready to successfully work with Legacy 7.5 and the new FamilySearch system. Hopefully the potential problems report doesn't give you too many surprises. But if it does, you'll be better prepared to share your information with others. The 7th annual Legacy Genealogy Cruise, held November 8-21, 2010, starts and ends in Sydney, Australia and visits the following New Zealand ports: Fjordland National Park, Dunedin (Port Chalmers), Christchurch (Lyttelton), Wellington, Napier, Tauranga, Auckland, and Bay of Islands. We will sail on Princess Cruises Sun Princess ship. To reserve a cabin, or ask questions, contact our travel agency, AA Travel Time at 888-505-6997 or send an email to book@aatraveltime.com. Special Sale: $20 off on Legacy Add-On "Heritage Collector Suite"
Heritage Collector Suite is the Legacy Add-On software which organizes your digital photos, creates narrated slide-shows, publishes family photo books, and much more. For a limited time, save $20 on your purchase of Heritage Collector Suite. That's $64.75 of free software when you purchase Heritage Collector Suite today! For more information, or to purchase, click the Buy Now button below. This is a quick follow-up on last week's Location Standardization article which discussed the need to standardize your locations in Legacy. While testing the new FamilySearch feature in the forthcoming Legacy 7.5, I randomly picked an ancestor, Hannah Hall, to see if the FamilySearch database had any more information than I had. It sure does. In the image below, the information I have about Hannah is in the "My Legacy Person" section. The information from FamilySearch is in the "FamilySearch Person" section. FamilySearch has 41 different opinions of when/where Hannah was born. Some have sources. Some do not. That's just the nature of published information. These opinions were published by various researchers over the years. Most of the opinions are identical except for the spelling of the location. In this case, Taunton has 30 different spelling variations. Some are abbreviated. Some are misspelled. Some include the name of the country at the end. I suspect that most of this information was published to earlier FamilySearch databases, before the Standard Finder was implemented. If, decades ago, when we started doing data entry of our locations, we had a standardization tool that everyone in the world had access to, we probably would not see many people with 30 spelling variations of the same place. And while the new Standard Finder, in its infancy, still has its limitations, it is laying the foundation for us to be more consistent in our data entry efforts. You can begin now by cleaning up your own Master Location List. Watch this video for step-by-step instructions. What Happens When Cousins Marry? I, like many (I assume), have ancestors who married first or second cousins. This causes havoc when trying to create reports because the same people show up in different lines creating an endless loop. Is there a simple solution? You're right, when cousins marry, and you're looking at a their child's pedigree, the same ancestors will appear in different parts of the chart. UNLESS, you turn on the "Don't Repeat Duplicate Lines" option. Look at the pedigree chart below. The starting person, Jonathan Smith, was the child of two first cousins who married each other. Jonathan's parents had the same grandparents. The grandparents are highlighted in red. But take a closer look at Gertrude's grandparents. Below their names is the phrase "Duplicate line. See Chart 1, Pos 8/9)". Because I've turned on the "Don't Repeat Duplicate Lines", the pedigree chart will only follow the grandparents' line once. To turn on this option, in the Pedigree Chart's Report Options, click on the Format tab and select "Don't Repeate Duplicate Lines".